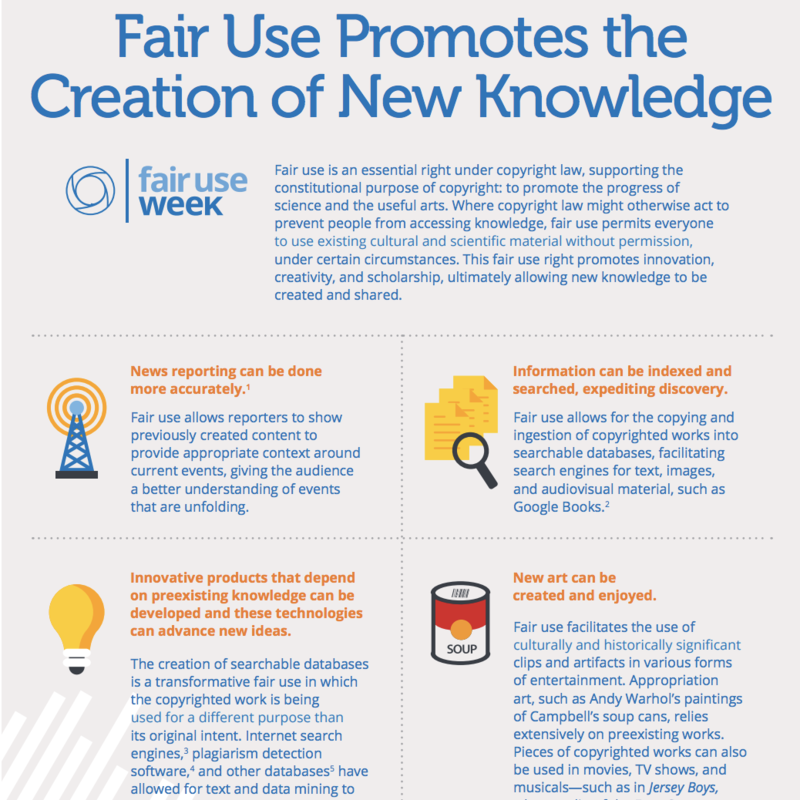 In keeping with tradition, ARL has released a new infographic in celebration of Fair Use/Fair Dealing Week. While I’m a big fan of all of our past infographics (Fair Use Fundamentals, Fair Use in the Day in the Life of College Student and Fair Use Myths and Facts), here’s what I love about this year’s infographic, Fair Use Promotes the Creation of New Knowledge: it reminds us that fair use isn’t just about someone using existing information, but about relying on it for new creations. 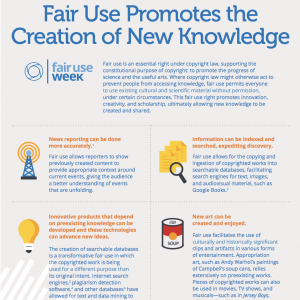 Fair use facilitates all types of new knowledge, from news reporting to the creation of innovative technological products, to scholarship. In the digital environment, in particular, creating new high-quality content and disseminating it widely has become easier. User-generated content is highly popular and often relies on fair use. While the Fair Use Promotes the Creation of New Knowledgeinfographic contains several different examples of the type of new information and culture that fair use enables, I want to highlight some great examples of user-generated content, such as fan fiction, remix songs and mashup videos. One of my favorite examples is this video by Movie Remixer on Youtube which mashes up 66 movie dance scenes from 60 different movies with Justin Timberlake’s 2016 song, “Can’t Stop the Feeling.” The clips are from a very diverse set of movies, ranging from old musicals like Singin’ in the Rain and the King and I, to classics like The Red Shoes and Babes in Arms, to more recent Academy Award Best Picture Winners like Slumdog Millionaire and Silver Linings Playbook, to 1990s comedies like Mrs. Doubtfire and The Mask. The mashup is highly creative and what I found to be particularly impressive was that it uses so many movies that have nothing to do with dancing and that the user/creator didn’t speed or slow down any of the clips to fit the rhythm of the song. Here’s another excellent mashup, entitled “Mean Disney Girls,” which uses dialogue from the 2004 movie Mean Girls and merges it with clips featuring Disney princesses from Cinderella, Sleeping Beauty, The Little Mermaid and others. In an example of mashups that go viral, this video has more than 13 million views on YouTube. YouTube will now protect some of the best examples of fair use on YouTube by agreeing to defend them in court if necessary. We are offering legal support to a handful of videos that we believe represent clear fair uses which have been subject to DMCA takedowns. With approval of the video creators, we’ll keep the videos live on YouTube in the U.S., feature them in the YouTube Copyright Center as strong examples of fair use, and cover the cost of any copyright lawsuits brought against them. While the Ninth Circuit has found that copyright holders must consider fair use in issuing takedown notices in Lenz v. Universal Music Corp., also known as the “dancing baby” case, with automated takedown notices being issued by corporate rightholders, this many not always be the case. This year, during Fair Use/Fair Dealing Week, I’m celebrating all of the great new works we benefit from thanks to fair use. This entry was posted in Uncategorized and tagged fair use, fair use week, fair use week 2018, infographic, user generated content on February 27, 2018 by Krista Cox. This entry was posted in Uncategorized and tagged fair dealing, fair use, fair use week, fair use week 2018, roundup on February 27, 2018 by Krista Cox.